ATENÇÃO: Não contém áudio ou legenda em português. Favor Verificar dados técnicos. A handful of desperate characters come together unexpectedly one winter evening in this comedy-drama. Lefty (Stephen Baldwin) is a luckless sad sack whose life has been in a tailspin since his wife Heather (Faline England) left him two years ago. Lefty has been struggling to win back the right to visit his daughter, but since losing his job and periodically stumbling in his efforts to give up drinking, he's been so broke he can't afford to pay his rent, let alone hire a lawyer, and after a meeting with Heather's attorney goes badly, he decides he needs to get his hands on a gun. Meanwhile, Lefty's aging mother Eva (K Callan) has fallen into a depression as her health has begun to fail her, and she's decided that Christmas Eve would be as good a time as any to do herself in. Elsewhere, Mary (Mary Thornton) could use some help looking after her son Jacob (Dominic Scott Kay), after her husband Rick (Kevin Downes) suffered a severe head injury during a motorcycle accident a year before with his best friend and riding buddy, Mitch (Mitchell Jarvis). And Mark (Richard Fancy), the pastor at a local church, has been persuaded to take a group of kids out Christmas caroling -- a task he does not relish. Somehow, the fates conspire to bring the principles together with Christmas just around the corner to give them the hope that's been lacking in their lives. 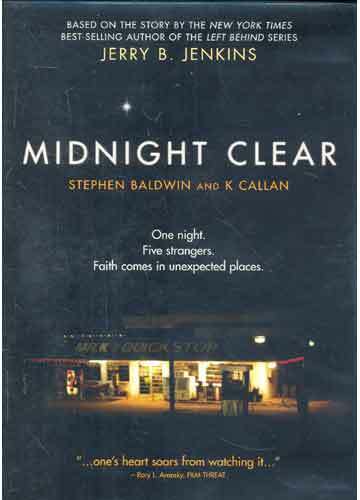 Midnight Clear was the first feature film from director Dallas Jenkins, adapted from a short film of the same title he made the previous year.